I saw on the news tonight that 300-some people have been caught speeding at over 100mph in the past year or two. I wonder how many people regularly travel at speeds of over 100mph. Probably more than 300, since speed traps aren't everywhere. Anyhow, it's wrong to speed, even if I think speeding in certain situations is worse than others. Our highways are technically constructed so that people could travel at 100mph safely. Everyone is traveling in the same direction, and the roads are wide with very few tight curves. Like the German Autobahn, our interstate highway system was developed to transport our military around the country. While we have more large trucks on these roads, the highways would generally be safe for high speeds at the right times. Going 40% faster than the posted limit is unsafe, but it's not necessarily reckless when the road is relatively empty. That's not the case on some of our arterial streets, especially in Jacksonville. I have seen people doing about 70 on 45mph roads that have bus stops, parking lot entrances, and pedestrians. That's about 60% over the speed limit. More dangerous than 100 on the freeway. Plus, I'm pretty sure 70 is a conservative estimate, since I was probably going 55 myself. Allegedly. The 100mph news story did get my to remembering the good old days, however. The times I've been up over 100 myself. The cars, the people, the places. 1988 Merkur Scorpio. When my dad got his Scorpio, he liked the high-end speed, having owned mostly Chevys throughout the 70s and 80s. He took that car up over 100 on County Road SC near Ixonia, WI, where he grew up. It used to be that the stretch between St. Paul's Lutheran and CW was clear sailing. I worried a little bit about a tractor pulling out in front of us, but maybe that's just a city kid not understanding the neighborhood. My dad also had us up over 100mph while trying to get us to some train ride in West Virginia for which we were running late. The third time we took the Scorpio up over 100mph was when we traveled across Nebraska on a state highway, which is more boring than Nebraska on the interstate. 1972 Chevrolet Camaro. We owned this car for maybe one full year, inherited from my grandma. I'm actually not sure we ever got it over 100mph, but I also don't care. Every time I sat in the car, messing with the stereo or reading the manual, it felt like the car was speeding. The Camaro was destroyed in an accident at Appleton and Nash in Milwaukee on the way to school, with my sister driving, a full year before I'd even get my license. I found that the car had a 305 rather than a 350 V-8, but I also think this particular Chevy (unlike my dad's Vega, Malibu, and Chevette) was made to go over 100mph. 1990 Plymouth Acclaim. Probably the most surprising car anyone could ever own. This Acclaim with a 2.2 Turbo was a crazy-fast car. I had friends with older Mustangs and newer Geo Storms that couldn't come close to the acceleration of the Acclaim. And I had a luggage rack on the trunk, just in case I wanted to strap a set of Samsonite suitcases to it. Probably the worst car ever for a 17 year-old boy. I had it up over 100mph on SC, then on Hwy 45 near the Zoo Interchange, and then twice on 43 near the Marquette Interchange. One of those times, I was impressing my friends and the other time it was for the benefit of Cousin Charlie and Cousin Chelsea. Always pretty stupid, especially since the Acclaim didn't exactly handle like a Scorpio or a Camaro. But it was still safer to try 100mph in the Acclaim than in my 87 Chevy Cavalier. 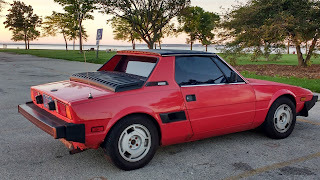 1986 Bertone X 1/9. How often do cars with 75 horsepower get a chance to travel at 100mph? Twice, actually, at least for my Bertone. I had it to 100mph the first year I owned it, back in the late 90s, on my way up to UW-Green Bay. I was running late for hanging out in the dorms with my friends, so that was enough to test the car's limits. In 2017, I also decided to keep up with traffic on the I-95 one time in the X. The top speed is supposed to be 105. I did not keep pushing after 100, so I can't say for sure, but I can say the 75 horses in my 1,500 cc engine can still get the job done, until it starts running hot. 1983 Mercedes-Benz 300SD. When I was traveling around Toronto, I joked to my wife that the speed limit was so high in Canada, since I was flying with the far left lane traffic at 100mph (not 100 kph). Oh yeah, I was also running on vegetable oil at the time, since I'd converted the Diesel to run with a Greasecar veggie oil hybrid kit. Of course, I know my Saab 9-5 and my Lincoln MKZ can go 100mph, but those are technically boring cars with which to drive fast. Any soccer mom could drive a Saab or Lincoln at 100. Yet, I don't believe I've bothered with these cars, except maybe to pass for a very short burst. If you can find a semi traveling over 90mph, it's tempting to follow, since we all know who gets that ticket. Remember that just because all modern cars, even Kias, are made to travel safely at 100mph, that does not mean we need to test the limits of those cars, our own reaction times, or the skittishness of other drivers. I don't want anyone to think that I am glorifying traveling over the speed limit. In fact, my speedometer was likely completely wrong in all the instances listed here. Let's just say that I may have allegedly nearly come close to speeding at over 100mph at some point, and I feel terrible about the whole thing.